Senso is a trademark of the company Čaltex.d.o.o. Advanced professional training of its employees, improvement of working conditions, new machinery and equipment for production of mattresses and pillows, as well as keeping up with the latest trends in industry, make Senso products competitive in the world market. Good quality sleep and rest are essential to good quality health and performance of everyday activities of humans. Sleep is a natural and periodic state of rest during which consciousness of the world is suspended. Lack of sleep can lead to some serious disorders; therefore good quality sleep and rest are of the utmost importance for accumulating and storing ener. We use energy while we are awake, and we regenerate when we sleep. This is why special attention should be paid when choosing a pillow and a mattress, as they are both essential for getting good quality rest. Mattress should support the body in order to equally distribute body weight, thus reducing pressure to the spine. We all spend one third of our life in bed, which is why it is essential to your health to invest in quality mattress and pillow in order to improve your quality of sleep as well as quality of life. Good night sleep is necessary in order to feel enthusiastic throughout the day, and be productive and full of energy. Senso offers 4 basic types of mattresses, designed and manufactured with the help and advice of experts, which gives customers a chance to find the right type. MEMORY FOAM is made from polyurethane with additional chemicals that increase viscosity level and allow it to mould itself to the weight and shape of a human body. Viscous-elastic polyurethane foam is thermo-active foam that reacts to temperature and pressure, moulds itself, “memorizes“ the shape, and then returns to its original position, thus distributing the weight and minimizing pressure to a spine. Caltex produces viscoelastic (memory) foam with different densities from 50 kg/m3 up to 100 kg/m3. 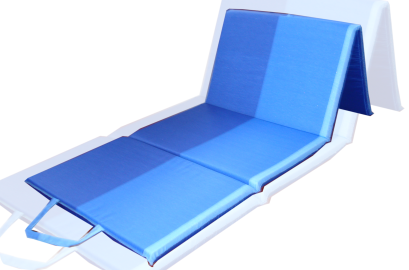 Beach mads are made of the quality materials and attractive design. ČALTEX d.o.o. © sva prava prodržana / SENSO je zaštitni znak firme ČALTEX d.o.o.